After months of waiting and dry-Trumping, Stephen Colbert finally interviewed Republican-nomination frontrunner and cosplay inspiration Donald Trump on Tuesday night’s Late Show. Colbert fired off an early shot in his monologue, when he joked that he might one day be able to tell his grandchildren that he’d interviewed the last president of the United States. But the anticipated clash between the real-estate tycoon and the titan of late night never really transpired, as Colbert kept things mostly civil and playful, and Trump did his best impression of being avuncular. The Late Show host gave the recently unemployed man and Level 2 birther a chance to take back some of his racist comments. But the Tangerine Dream demurred, insisting he had nothing to apologize for. Colbert then engaged him in some role-play by standing in for Mexico’s president, and Trump laid out his plan for a border wall, which still sounds like something out of The Simpsons, right down to the door. Trump was even reserved when accepting praise for his ersatz running mate, the “Make America Great Again” hat, which he failed to acknowledge might have been inspired by one of Colbert’s books. 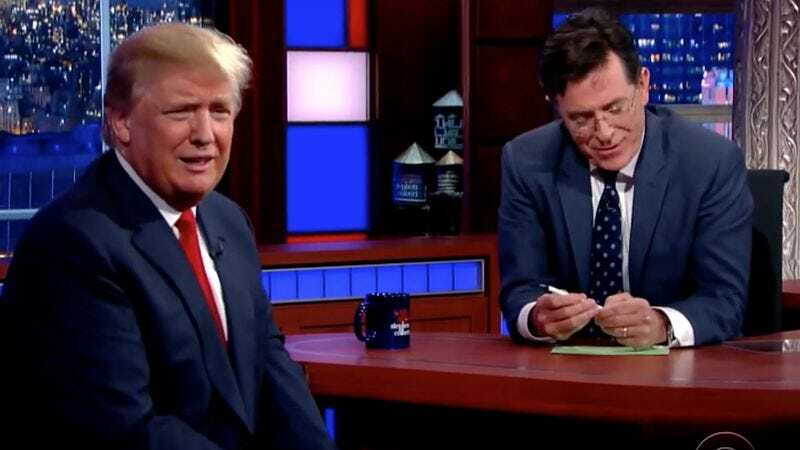 But during a game of “Trump Or Colbert,” he proved he’s at least kept up with his own blustering when he correctly identified which soundbites were his bits of inanity, and which quotes were from Colbert in character.